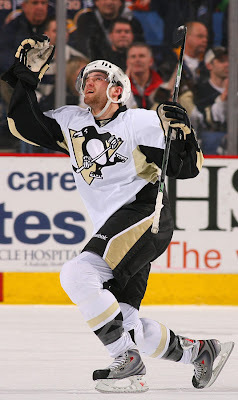 Already missing Sergei Gonchar, Brooks Orpik and Kris Letang, the Pittsburgh Penguins will now play without the services of Alex Goligoski. "Go-go" will be out two to three weeks due to a "lower-body" injury. The Penguins received a boost last Saturday when mega-star Evgeni Malkin returned to the lineup; but they lost Goligoski who still played in excess of twenty-eight minutes in that game necessitated by their already depleted blueline situation. We cannot recall any time when a team has had to replace their top four defenseman before. What will the Penguins do? Call up Pittsburgh native Nate Guenin of course! The rate at which Pittsburgh is losing their defensemen may spark call ups Deryk Engelland, Ben Lovejoy and Guenin to advise their pals with the Baby Pens to keep their bags packed and ready for a trip to Pittsburgh.